Here is a question that we are often asked. 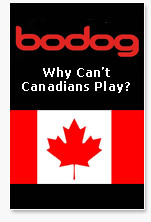 Why doesn't Bodog, one of the biggest poker rooms online, allow Canadian residents to play at their site? You allow Ethiopian residents to play, but not Canadians? What's up with that? So if there isn't any anti-gaming legislation in Canada, why should they care? This is a pre-emptive move by these companies. Canada, like many other countries, has much grey area when it comes to online gambling. Should the Canadian government ever start to crack down on online gambling, these companies want to be able to make sure that they can say that they don't service Canadian residents. Better safe than sorry is the policy being taken by these companies. Sure Canada is a sizable market, but they don't want to incur the ire of the Canadian government, so they simply refuse any and all Canadian residents to use their sites. So if you are Canadian and ever wondered why Bodog seemed to have something against you, that's why.